Data on consumption of drinks in 187 countries reveal the diversity in hiring and the current trends in global consumption of sugary drinks, fruit juices and milk. A research team led by scientists at the Friedman School of Nutrition Science and Policy at Tufts University reported today on Plus One that consumption of all three types of drinks was lowest in East Asia and the consumption of sugary drinks higher in the Caribbean. Overall, young adults consume the highest levels of sugary drinks, while the elderly consume more milk. "Our analysis highlights the consumption of beverages in the world. We know that various drinks have a different impact on health," said Gitanjali Singh, MPH, Ph.D., study author and professor at the Friedman School of Nutrition Science and Policy at Tufts University. "The research results identify important changes in beverage consumption among various subgroups International, evaluate the impact of these drinks on the overall health and may help in the development of nutrition policies oriented to health for specific populations." An international team of scientists - the Global Burden of Diseases Nutrition and Chronic Diseases Expert Group - has contributed to this analysis. The team evaluated the data of 195 dietary surveys, considering more than half the world's population, and has also incorporated the data on the availability of food in 187 countries, in the years between 1990 and 2010. Taking into account the differences in these sources data, statistical analyzes have determined the levels of average consumption of sugary drinks, fruit juice and milk in the period 1990-2010 among men and women divided into seven age groups in 187 countries. 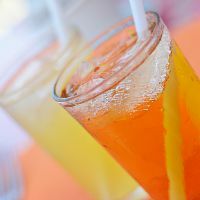 sugary drinks have been described as "soft", fruit drinks, energy drinks and sports equipment, iced tea sweetened and unsweetened lebevande homemade as "fresh"
The higher intake of sweetened beverages in the Americas, particularly in parts of Latin America and the Caribbean; higher intake of fruit juice in Australia and East Asia; and the highest intake of milk in northern Europe. Large variations according to age, with a higher intake of sugary drinks in younger and higher milk intake in the elderly. Globally, consumption of sweetened beverages was highest in men aged 20-39. Consumption varies from region to region, the lowest in East Asia and highest in the Caribbean. Women over age 60 have had the lowest consumption of sugary drinks. Consumption of fruit juice was higher in women aged 20-39. On average, the consumption of fruit juice increases with the level of income country. United States: about 0.36 portions of fruit juice a day, the 21st highest consumption of 187 countries. Women over age 60 are the largest consumers of milk. Typically, adults in the richest countries drank more milk than those in poorer countries. In the United States: on average 0.69 servings per day, the 64th highest consumption of 187 countries. "The location was the most critical factor in the different levels of consumption of these beverages. For example, the consumption of sugary drinks was very high in the Caribbean and Mexico," said Dariush Mozaffarian, one of the authors of the study and dean of Friedman School. "With these data, we can begin to establish and improve policies that promote the consumption of beverages with low sugar content in specific countries." Additional research efforts, which include data from children, are now underway.